You crawled out of bed on a Sunday morning to pick at your dinner leftovers from the night before. Without bothering to change out of the cozy sweatpants or the three-year-old t-shirt, you bring the empty takeout container to the waste management bins. Does this plastic clamshell box in your carryout bag really belong in the blue bin? The air’s too cold, you’ve made a choice and the Earth will be a better place thanks to your disposal. Unfortunately, you were wrong with this decision. When it comes to all things “food,” it can get difficult. You need to pay attention to the shape and size of what you’re trying to recycle. Lucky for you, with a little practice, this will all make sense. When you visit a restaurant for a pick-up order, proper disposal of the items is the last thing on your mind. However, the plastic bag that this food came in can actually be destructive to your local waste management site. Plastic bags don’t belong in your traditional blue bin. This is due to the fact that these pesky pieces of plastic can easily get tangled in machinery. Even if you find one of the recycling arrow symbols on your bag, don’t take this as a sign that it can be thrown out with the rest of your waste. This symbol is simply signifying what material the bag was made from. Many stores offer bag returns, allowing you to rid your home of this nuisance safely. Just remember, “When in doubt, keep it out.” Your single stream waste management bin can be an issue because of the increased amount of contamination in it. Use our recycling guide to understand how best to send your items down the path of reduce, reuse and recycle. It’s the time of the year where you’re enjoying some of the biggest feasts. You’re getting disposal happy when you should be focusing your efforts on recycling. If you did Thanksgiving wrong, you’ve still got time to correct yourself before the year ends. The biggest tip you can take away from this and incorporate in your own kitchen is to “waste not.” In the U.S., 40 percent of food is wasted. On average, 20 percent of the food you’re piling into your cart at the store will never even get used. You are probably one of the 90 percent of Americans who put food through your disposal process too soon. Instead of being the average home that wastes $96 on food each month, pay closer attention. Make lists and plan ahead by keeping your eyes on food labels. The way you store your items will make all the difference. Utilize food that is “past its prime” through alternative methods—for instance, a brown banana might not look appetizing, but it’s going to make the ideal loaf of banana bread. Read about it and start getting creative. Now is the perfect time to create your own compost system. Do your research and repurpose your food. This spring you could be looking at a green, lively garden. When you’re trying to get to the Christmas gifts, waste management is the last thing on your mind. There’s wrapping to do and dishes to be done. 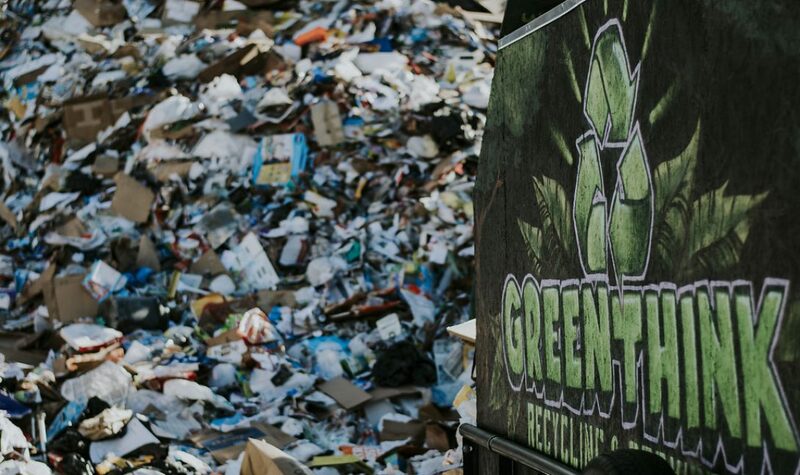 How clean does someone’s recycling actually need to be according to guidelines? Luckily, small morsels of food left in glass or steel containers won’t affect that form of recycling. But you should still do your part to prepare all materials that leave your home for an optimized-level of recyclability, improving the overall quality of the new material. The question remains, should you conserve water? Or should you let things be recycled as they are? Some simple waste management guidelines to live by include: make sure the container is empty before it ends up in the bin; rinse out thick substances; and not all items need to be cleaned. If there’s a good amount of food or items in a container, there’s a good chance that it’s actually going to end up in a landfill. If you go through peanut butter or another sticky substance this season, rinse it out. When it comes to non-toxic chemical containers, like shampoo bottles and laundry detergent, these items don’t need to be rinsed. As a matter of fact, this will actually help the recycling process because it will take less to clean them. Always remember that when you’re going through this disposal process, your rinse does not have to be perfect. Get a good amount of water in the container, shake it up with the lid on, empty it out and you’re good to go. Waste management shouldn’t be the source of your stress, no matter what time of year it is. Find the ways you can best take care of your food waste this year.